~ Kicking up my heels in the kitchen. When Twitter first came on the scene, I wasn’t really sure what to do with it. I had Facebook and email and a blog already, so did I really need another way to connect with people? But I signed up anyway. And, as it has grown, I’ve come to see all sorts of benefits that I could not have previously imagined would come from this micro-blogging/communication/networking phenomenon. I’ve made new friends, found news stories and been given a few new recipe ideas. 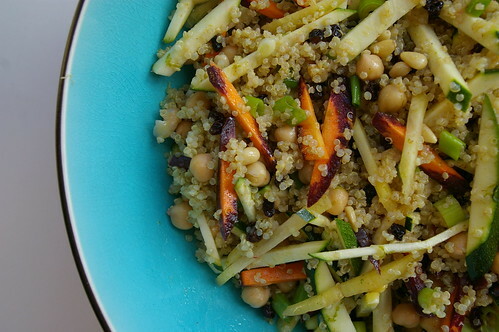 This Quinoa Salad with Curry-Lime Vinaigrette is one of those recipes. A friend tweeted she had been thinking a lot about biryani-style quinoa dishes. I was curious and asked for links, which she happily sent along. I liked the idea of them, but neither of the recipes really grabbed me as a whole. Instead, I was more interested in picking and choosing the bits and pieces from each that were intriguing. And I was more than motivated to try out something similar, having impulse bought a three-pound bag of quinoa from Costco. Seriously. Some people impulse buy gum; that makes a lot more sense. I’ve liked quinoa for some time, ever since trying it with veggies and a peanut sauce at the Coup. But the idea of cooking it was a bit intimidating. Various reports of it being bitter or improperly cooked were enough to make me shy away from it. And then I saw on the back of this bag that you could cook it in a rice cooker. Can I make a confession here? I don’t really know how to cook rice on the stove because a former boyfriend bought me a cooker when I came back from Japan (where I had fallen in love with the one in my little townhouse). Now that’s all I use. So, knowing I could make perfect quinoa in the rice cooker was enough for me to put the giant bag of the stuff in my equally giant Costco cart. And then I got it home and didn’t really know what to do with it. So, I made this salad with quinoa and carrots and zucchini, currants and pine nuts and sort of make-it-up-as-you-go-along dressing based on what I thought would be good with hints from the other two recipes I read. Tossed it all together and it was fantastic. So I ate some more. And then I tweeted it and people started asking for a recipe. So, I made it again last week and actually wrote down what went in this time. I was at the farmer’s market and bought some oddly coloured carrots (because I also impulse buy strange vegetables) and used them in the salad because I thought they’d be pretty. They were. 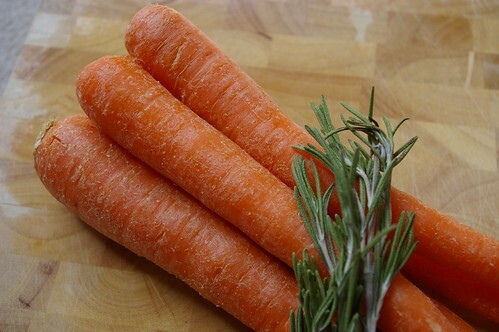 But the first time I made this I used straight up normal carrots and it was just as fantastic. 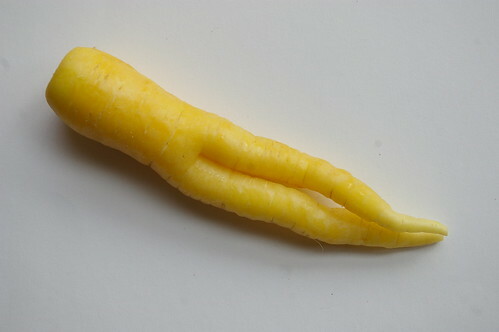 Oh, and here’s the best tip I’ve read in a while for julienning vegetables perfectly. First cut it in diagonal slices, then stack those and cut into sticks. So much easier and they always look fantastic. This is great right away, even better if you can let it sit for a bit so everything has a chance to hang out. Lastly, I’d say that the beauty of a salad is it is infinitely adaptable. Don’t like pine nuts? Use sliced almonds instead. Currants are great, but I bet diced apricots or a handful of dried cranberries would also be delicious. And so on. 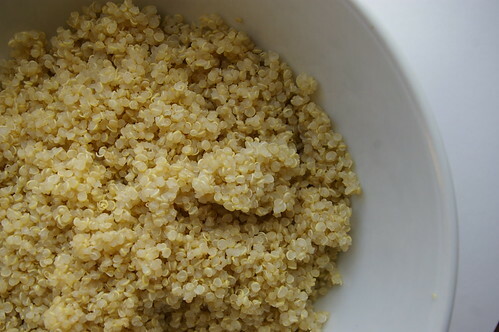 Cook quinoa according to package directions or using the “white rice” setting on a rice cooker. Set aside and let cool then place in large salad bowl. Julienne carrots and zucchini, then slice green onions. Add to quinoa. Stir in chickpeas, toasted pine nuts and currants. 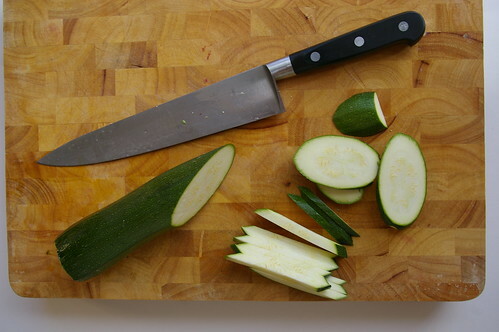 To make dressing, zest lime into a bowl, then add lime juice and honey. Whisk to dissolve honey, then add salt and spices. 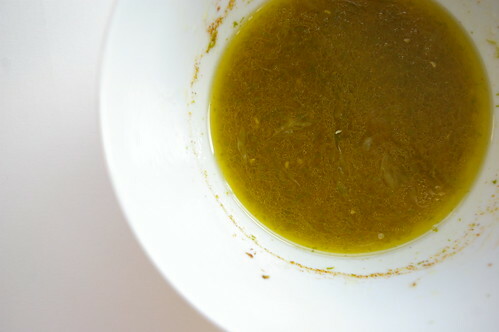 While whisking, slowly add oil to emulsify. Pour over salad and toss. I love scones. I like sweet ones with devonshire cream and jam. I like savoury ones with a little butter. But scones don’t seem to feel quite the same way about me. Or maybe they sense fear. One of the last times I remember making scones was when I was living in a small town in southern Japan. While I was the only foreigner in my community of 10,000, I was eagerly welcomed by many of the locals, including my next door neighbour who preferred to be called Susan. She was married to one of the teachers at the high school where I also taught and they had a young son. (We lived in a rather unattractive triplex — is that what a set of three townhouse-type homes is called, if a duplex means two? — that was teachers’ housing, along with the school’s vice-principal.) She was a very sweet woman who often had me over for dinner and hosted a pretty large (when one considers the relatively tiny size of her living room) dinner party when my then-boyfriend, mum and little sister came over to visit. At any rate, she signed us up for a cooking lesson with a women from the U.S. Naval base, stationed in nearby Sasebo. The subject was, of course, scones. So, here I was, the lonely foreigner amongst a group of Japanese housewives learning to bake scones from some southern U.S. navy wife. Truly one of the stranger experiences. Susan and I followed all of the directions faithfully, or so I believed. But our lovely little scones were nothing more than dough rocks by the time they came out of the oven. The instructor was convinced we had done something wrong (and I guess we must have), but I was so confident we had followed the recipe exactly. I didn’t bother to attempt scones again for several years. Mostly, I suspect, because it’s one thing to bake cookies for a crowd and quite another to show up at work with a pile of scones. And also likely because deep down I harboured some anxiety that I would put in all that effort and still come out with flavoured rocks. 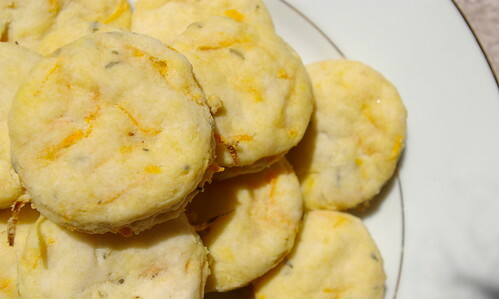 And then I saw a recipe for Carrot and Rosemary Scones. I love rosemary. 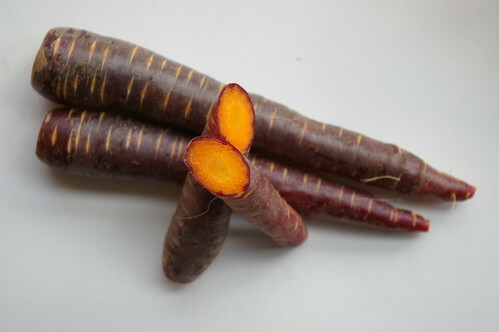 And carrots. And dijon mustard. And garlic. And parmesan cheese. The fact that all of these things were combined into a flaky scone was enough to jolt me out of my scone slump. But it wasn’t going to be a breeze. When I first attempted these, I found the mixture unbearably dry, but was nervous to add more liquid since I know making a light and fluffy scone requires some delicate baking chemistry. In the end, I did add some more cream, but it was still quite a dry dough. 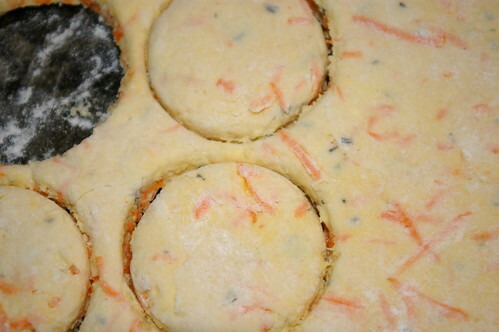 Once baked, the scones were still quite flat and not very brown. That’s not to say they weren’t tasty; they were. But not scone perfection. The next time I called my mum (to whom I turn for all baking advice, her being a stellar baker and, I suspect, slightly amused by my ongoing need for guidance) and she said to not fear the addition of even more cream as the lack of liquid may have contributed to the rather flat outcome of the first attempt. Take two on the scones was slightly more successful — they were, at least, a little more golden and the dough had come together more easily — but only just. They were still flattish, though. I sent the recipe along to my mum in advance of a visit out to Vancouver so that we could have a hands-on attempt together. (Baking, I feel, is best learned by participating at the side of an expert.) Not only did we almost double the amount of liquid, but, in the end, they still didn’t rise as much as other scone recipes. We eventually concluded the weight of the carrots was likely the culprit. On the next attempt, I used my food processor to cut in the butter (justifying it as that I had to pull it out for grating the carrots anyway) and then added much more cream (a mixture of whipping and half-and-half because I wanted to use up the heavier cream) than originally called for. I also accidentally forgot the parmesan. So, I’m unsure which, if either, of those decisions played a role in the outcome, but these scones were beautiful. They rose! They were tasty! They were flaky! 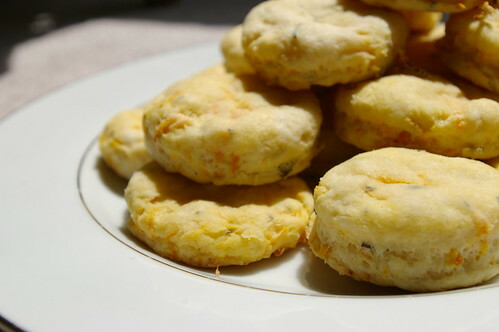 They still didn’t rise as much as other scone recipes; I blame it on the carrots. While this recipe originally comes from Clotilde at Chocolate and Zucchini, I have made some adjustments. Below is the recipe as I make it. Preheat the oven to 350. 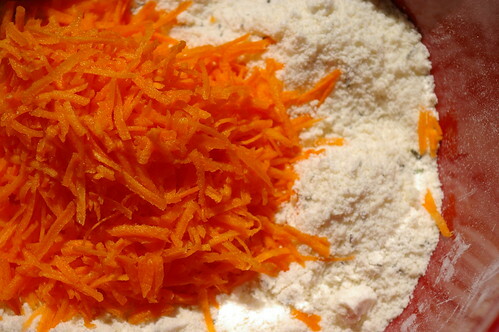 In a mixing bowl, combine the flour, baking powder and salt. Add the butter and rub it into the flour mixture with your fingers or using a pastry blender or in a food processor, if you have one. It should resemble coarse crumbs when it’s blended enough. 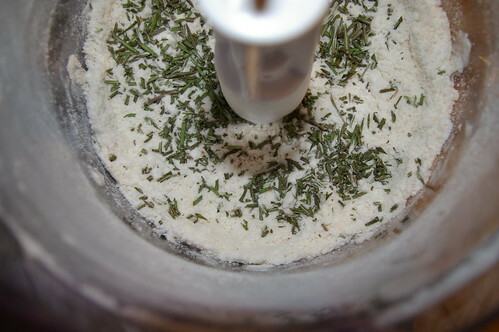 Add the carrots, rosemary and cheese if you’re using it. 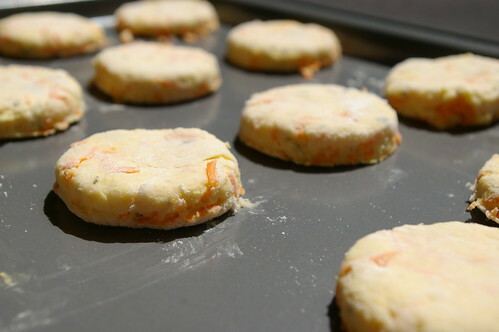 The original recipe calls for 20 minutes in the oven. Mine baked for 17 before they were nice and golden. Cool on a rack. And then try to keep yourself from eating too many.